And leading the galloping pack into vet gate two was...Lithuanian rider Alisija Zabavska-Granger and Merlin! Shaikh Mohammed was just behind them, with over a dozen coming in right on his tail. Maria Alvarez and Nobby weren't even in the first dozen horses. Right in the fray were Americans Meg Sleeper and Syrocco Harmony, Deborah Reich and DJB Juniper, Lindsay Graham and Monk, and Heather Reynolds and Ssamiam. German Gabriella Forster was up there on 12-year-old Priceless Gold (this pair finished 8th in the 2007 European Championship in Portugal, and former World Champion Valerie Kanavy rode him to an 18th place finish in the 2009 European Championship in Italy). 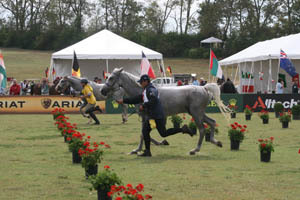 Shaikh Nasser of Bahrain on Khandela des Vialette (a 12-year-old mare who had won the 160-km CEIO in Compiegne, France in 2009 at 20.194 km/h) was up close. But it's the vet gate where many things change. It was this vet gate where Merlin was eliminated for lameness. Sure it was disappointing, but Alisija later said, "I had a blast riding with the Shaikhs. Merlin was at 100%. Ed did a great job training him. But... s**t happens! I never enjoyed the race so much before!" It was this vet gate where Shaikh Hamdan and SAS Alexis moved to first place and Shaikh Majid into third; Maria Alvarez and Nobby stayed in second place, though they arrived a minute behind the first arrivals. Shaikh Mohammed dropped all the way back to 14th place because of a miscalculation by those crewing his horse - Ciel Oriental's pulse was not down to criteria 64 beats per minute when he entered the vet gate. 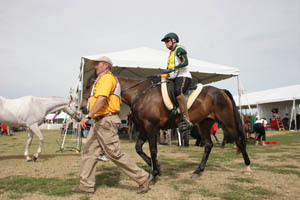 The handler had to rush the horse out of the vet box and back around into the crewing area, make sure the pulse was down, and re-enter the vet gate. Instead of taking, say, 1 minute 11 seconds to pulse down like he did at the first vet gate, it took 5 minutes 23 seconds to record the horse as officially down. That put him four minutes behind Shaikh Hamdan leaving onto loop 3. A few other horses had to represent because they blew the pulse, too, including Churinga Kagebee ridden by Ali Mohammed Al Muhairi. Jean-Philippe Frances and Hanaba du Bois moved into fifth place, from 16th on the first loop. 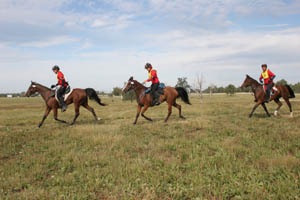 The top 5 horses all pulsed down in under 2 minutes, after travelling the loop at over 20 km/h. About this time I got a phone call from Steph, saying to stick around the venue and forget about taking pictures - the FEI website showing the positions of the riders crashed, and Hillary Bachman of Sport Horse International (who I never did get to see at the WEC) and I of Endurance.net were the only two keeping the world up to date for a while. So much of my afternoon consisted of badly typed messages (don't you hate it when your iPhone guesses at what you are trying to say? I tried to type "Hanaba du Bois" and it came out once as "Habana du bois" then "Banaba du Boise") to Ridecamp, while trying to watch everything (impossible in a spread out venue) and keep my iPhone charged (not possible without a plug!). While the vet checks looked like absolute chaos of humanity swarming horses, especially with big groups of horses arriving together, they were actually well-oiled machines, waves of people quietly as possible dumping water on horses and checking the pulse as one person slowly walked the horses toward the vet gate. When you had a horse like Nobby, who pulsed down in 1 minute 5 seconds (the first vet gate) or 1 minute 2 seconds (!!) 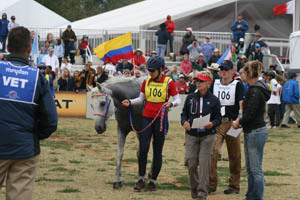 (the second vet gate), it was just one continuous smooth walk from the in-timer to the vet ring. 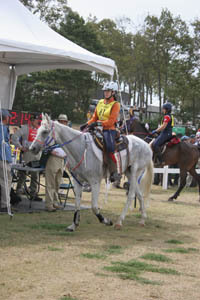 Ras Senor, the grey gelding of Argentine rider Mercedes Tapia lost a shoe out on loop two, as did the USA's Lindsay Graham and Monk, when he was stepped on from behind. Jeremy Reynolds, husband of Heather, replaced Monk's shoe during the 40 minute hold. Heather's horse Ssamiam, and Monk are barefoot horses. But, seeing the awful condition of the slick and muddy course last year, to be safe it was decided to wear a specially designed shoe with mud nails - good for the dry grass and good for mud, if it happened again on the course this year. You can see the special shoes on Monk's feet in Chris Martin's FEIRedhorse blog. 5 more horses were eliminated at gate 2, making a total of 11 horses so far. Loop 3 was a short 21.3 kilometers. Shaikh Mohammed and Ciel Oriental again arrived first, but would leave on loop 4 in 6th place because it took his horse 2 minutes 38 seconds to pulse down. Nobby again pulsed down fast, in 1 minute 3 seconds, which moved him into first place. On every following loop, Maria and Nobby arrived after other riders and horses (except the finish), but because of Nobby's phenomenal pulsing down, they left in first place. Shaikh Hamdan and SAS Alexis were in second, Shaikh Majid and Kangoo d'Aurabelle in third, Shaikh Dalmook of the UAE on Rukban Kikruhu Mmn in fourth, and France's Jean-Phhilippe Frances and Hanaba du Bois remained in 5th. Vet gate 3 was a shocker for the American team: both Lindsay Graham and Monk, and Jan Worthington and Golden Lightning were pulled - Monk for metabolics (he had an inverted CRI - higher pulse after trotting out than before), and Golden Lightning for lameness. He had a slight lameness trotting out the first time, but when he had to represent before going out on loop 3, it wasn't so slight. The day after the ride, Jan Worthington was still a bit stunned and rather devastated. It was only Leon's second pull (the first being at the finish of the World Endurance Championship in Malaysia, after a lightning bolt knocked him and Jan to the ground on the second loop). "I didn't notice anything out on the trail; he just trotted out lame." Afterward, Chris Martin, owner of Monk, was ever grateful for the fantastic opportunity to be on the US team with the horse he loves and believes in so much. That Monk made the US team was the cake; everything else was the icing on the cake. "We really did accomplish what we intended to do." Monk was looking good the next morning, "fantastic and ready to go again." Chris still believes in his horse and is looking ahead down the trail. "This has been quite a ride," he said. 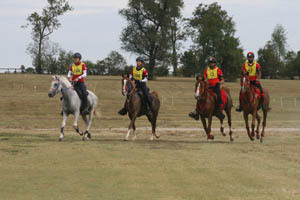 With Lindsay Graham riding as an individual, this still left the American team in contention. 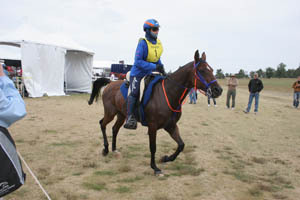 Six more horses were eliminated at gate 3, including Argentina's Agustin Vita, whose 12-year-old gelding Baraka Ibn Al Tamah had garnered a surprise second place finish in the 2008 World Endurance Championship in Malaysia. It had slowly warmed up during the day, but loop 4 could have been officially called warm and muggy. Clouds and a breeze at the venue kept things cool, but out on course it was hot. A big change for Australia's Matthew Sample from last year's Kentucky Cup pre-ride, when he got hypothermia in the freezing rain. 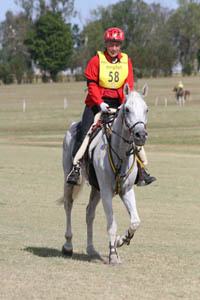 Matthew was riding 14-year-old Tarrangower Crecendo, a Tom Quilty winner. This was actually his second string horse, who moved up to first when his first stringer got a hoof abscess a few weeks before this ride. "He's a lovely horse to ride," Matthew said. He got off and ran alongside Tarrangower Crecendo a lot on this loop. Australian Penny Toft and Don were still going, though they slowed down considerably (from 19 km/h to 15 km/h) on this loop. "We went too fast the first two loops, but I just couldn't hold him back!" Now, especially with the heat, Don was getting a bit tired. Dutch rider Carmen Romer and Tuff Enuff FA were still pushing hard at 19.3 km/h, neither of them having (so far) shown any ill effects from their fall on the first loop. It was a bittersweet time for Carmen at this ride. "You know my horse that you rode?" she asked me under their crewing tent when I stopped by to say hi. I had visited the Dutch endurance team in 2007 and went for a ride on Carmen's nice half Arabian, half Akhal-teke, Eddie R. "He just..." Her words choked off and tears began rolling down her face. "He died..." They had gotten a call a few days ago while they were here in Kentucky. Eddie R had broken his leg. Nothing they could do. She wiped her tears away and turned her attention back to the horse she was riding here. It was yet another big blow to the Americans when Meg Sleeper's Syrocco Harmony was eliminated for metabolics. That meant the US Team was no longer in contention. 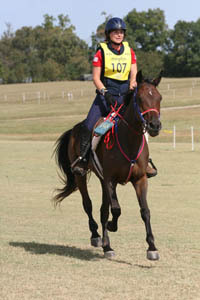 Only Heather Reynolds and Ssamiam, in 7th place, and Deborah Reich and DJB Juniper in 11th, remained on course. With 120 km (75 miles) now completed, Maria Alvarez and Nobby remained in first after the 27.2-km loop 4 (Nobby pulsed down in 1 minute 27 seconds); Jean-Philippe Frances and Hanaba du Bois second; Shaikh Majid and Kangoo D'Aurabelle third; Shaikh Hamdan and SAS Alexis in fourth; Shaikh Mohammed and Ciel Oriental in fifth. 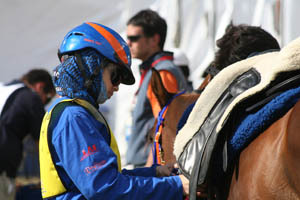 German Gabriella Forster and Priceless Gold remained only 22 minutes behind the leaders in 14th position, with the rest of the German team (Belinda Hitzler and Shagar, the Arnold sisters Melanie on Shaika Bint Kheoma, and Sabrina on Beau Ox) and the individual rider Petra Hattab on Prince Sharif, still going steadily. A total of 10 horses were eliminated at gate 4, including Portugal's Ana Margarida Costa on Gozlane du Somail, and Belgium's Maritza Pereira on Lima du Barthas for "Under Weight." Spot check weighing was done of random riders throughout the day, and these two riders were no longer carrying the minimum of 75 kilograms. Maritza Pereira was apparently 1 kilogram (2.2 pounds) underweight. She had been sick and throwing up for days before the ride, so perhaps she had lost the weight out on the loops, but she was finished nonetheless.